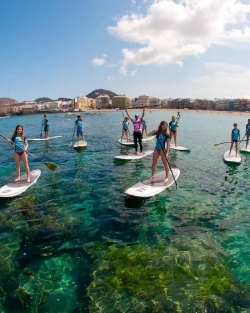 If you want to live a completely new experience, come and enjoy this complete sport, in the wonderful reefs of Canteras Beach, getting in shape and learning quickly and safely with the leading SUP school in Las Palmas. Are you ready for the challenge? Individualized Paddle Surfing Class. 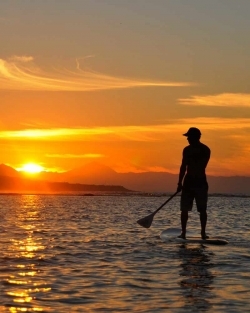 Hire your own SUP instructor and live a great experience by the confital bay. Residents Price: 18€ Find the balance between body and mind and harmony with the sea, become stronger and more flexible. 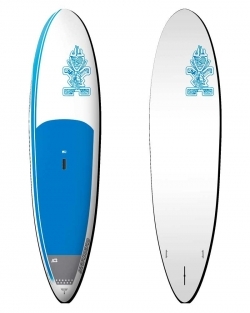 Whether you have been practicing Yoga, Pilates or Paddle Surf before, is completely irrelevant for you to enjoy for the first time the magnificent benefits of PADDEL YOGA. Temporarily Suspended Activity, until new notice. 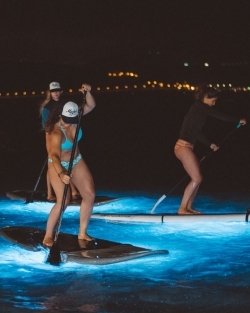 Share and live a magic night on Las Canteras Beach enjoying a Paddle Surf Night Tour . 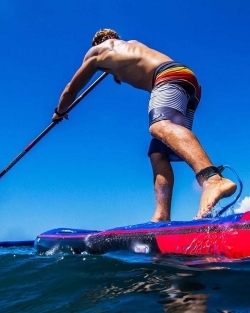 Come and enjoy this magnificent sport during the night, when the beach of the capital is calm and you can enjoy the bottom of the wonderful beach of Las Canteras, while you get fit.